I’ve been noticing more about my youngest child lately. I’ve been paying more attention to him, taking mental pictures more often, remembering cute things he does more often. He just turned six. A few weeks ago he held my hand in the parking lot as he clacked along to soccer in his cleats. He held onto his water bottle and kicked his size 4 soccer ball down the path. My purse was slipping off my shoulder and under my other arm I tried to press sunscreen and another water bottle and bug spray to my body so that they wouldn’t clatter all over the pavement. At the edge of the blacktop he kept holding onto my hand. A bolt of lightening hit me saying, “He might never do this again, he is so close to not needing or not wanting this anymore.” I struggled to keep holding onto him as long as he would let me, even though everything else I had kept falling. We only have a few weeks of school left, a few weeks where it is just him and me all morning long, just a few weeks before the time I get with him is always and forever shared with his older brother. Next year is first grade, and I have to share him with a whole series of teachers. In the afternoons I’ll have to share him with soccer and chess and whatever else interests him: new friends, books, computer games. These are the last few times I will take him to the library on a weekday morning, just the two of us. These will be the last weeks of eating lunch together while watching Blue’s Clues or Phineas and Ferb or Curious George. Today he asked me to dance around the kitchen with him. 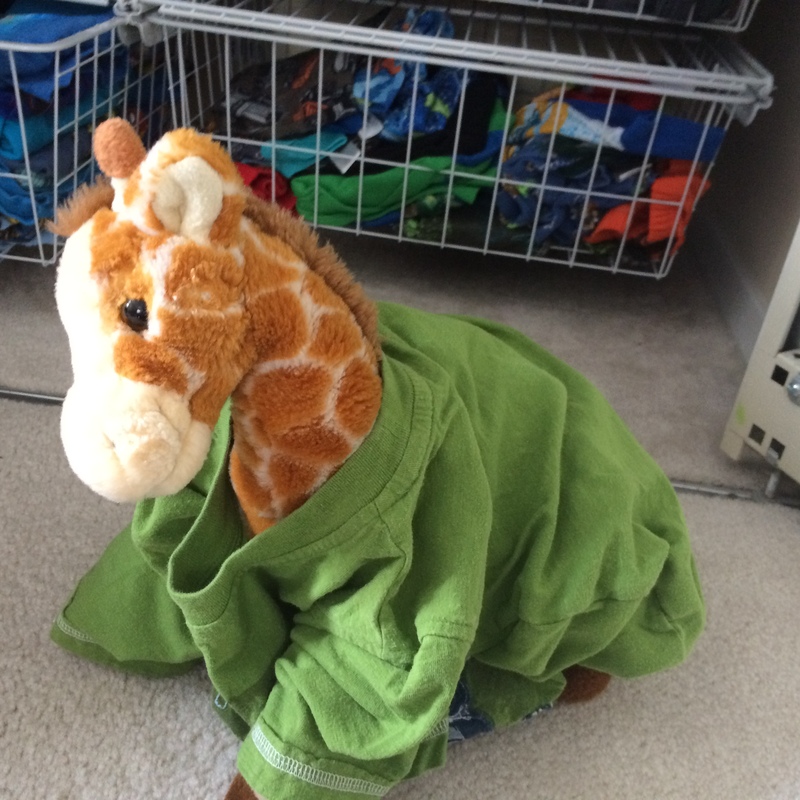 Today we put some of his summer clothes on a stuffed giraffe while he got dressed. Today he rode around the block on a too-small Dusty Crophopper bicycle with training wheels while I followed behind. Today he asked if I could come into his classroom to see the baby chicks that had hatched. Today he let me give him a goodbye kiss as I dropped him off at school, even as he asked if he could take the bus next year. I am going to miss this so much. It won’t be the same again. I know it’ll be okay, but while I had been telling myself over and over how much it was going to be okay, I didn’t realize just how deep my sadness really was. I have been so lucky to have had this time that I have. So lucky. Thank you, everyone and everything that has let me have this. I am certainly not a hipster. I also do not have any tattoos. But, lately, the tattoo I have been planning out in my head is a simple striped triangle. A representation of Maslow’s Hierarchy of Needs. My teacher friends might remember this concept from back in developmental psychology courses. The basic idea is that we are all motivated by irreducible needs, and that once we meet our basic needs we are able to climb higher to try to achieve more lofty ones. The concept is framed as a pyramid. The base layer of the pyramid contains our basic biological and physiological needs – our need for air, water, food, shelter, sleep. These needs have to be met for us to move on to the next level. The next level up contains our need for safety – protection from danger (whether that danger is a poisonous snake, a tornado, or a criminal), law and order, stability. The level after that contains our need for love and belonging – friendship, affection, intimacy, romantic love, family. The level after that contains our need for esteem – self-esteem, mastery, achievement, independence. The level after that contains our cognitive needs – stretching our brains, learning, finding meaning. The level after that contains our aesthetic needs – appreciation for, the search for and the creation of beauty. The level after that is our need for self-actualization – becoming the highest version of yourself you are capable of becoming. 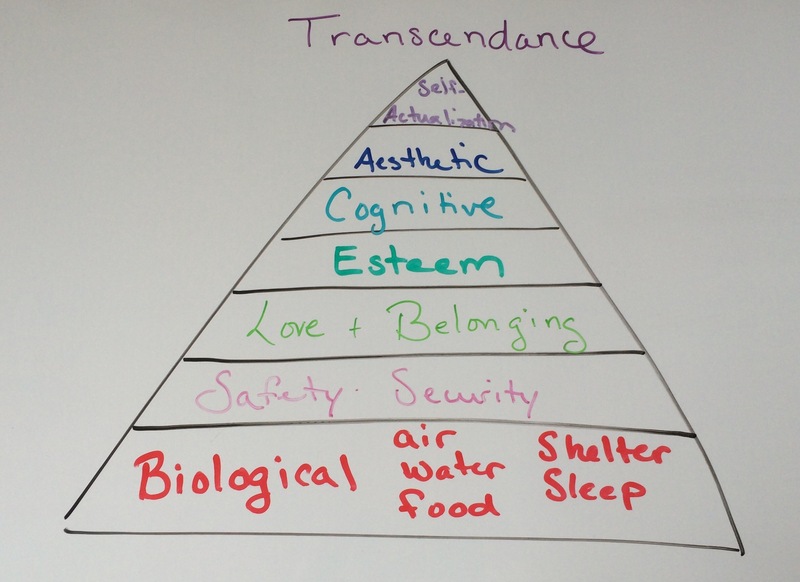 The last level is the need for transcendence – overcoming the limitations of human needs and human forms. It is complete spiritual fulfillment. This seems like an orderly way to explain the motivation of human beings, that once the bottom rung of needs are met then we can seamlessly turn our attention to the next level and so on and so forth. When I turn back to this model in times of chaos, it provides me with a way to get my life back under control. When the pain or fatigue or depression that can be associated with fibromyalgia begin to severely limit my ability to function, I go back to the pyramid. I go back to the basics and make sure I take care of each level I can in order. It helps. It also gives me an organizing principle for deciding what is most important for my children, for my family. Food, water, sleep, shelter first. We are very lucky that the first needs are securely taken care of. Safety is always next. This is such a part of our life that I can yell out to them at any given point, “What is my number one job as your mommy?” and they will yell back, “To keep us safe!” If there is a question of priorities, those win. It helps stave off bad behavior, usually. Most tantrums come about when basic necessities are off – the boys haven’t eaten in a while, they stayed up too late, they feel sick and need rest and medicine. My youngest had a tantrum this morning because his need for safety was not being met to his liking. He thought he would have to get a shot at his doctor’s appointment when he did not. Once he felt safe (all of his vaccinations are up to date and he needed no boosters) the rest of the day fell into place. This helps me prioritize what charities we support with the little extra we have. Charities that feed and clothe and shelter people get our attention first. Charities that keep people feeling safe and loved next. Charities that teach after that. If you can do all of those at once, even better. I taught in a public school and can tell you first hand how difficult it is for a child to learn if his basic needs, his need for safety or his need for belonging are not being met. Any programs that provide breakfast and a safe environment should be protected. Any wonderful people who can make a student feel like he or she is meant to be right there with them, who can make a student feel safe and accepted, should be truly appreciated. Then mastery and learning can happen. Not before. The pyramid as an organizing principle makes sense again. But, and this is very, very important, we as humans are not always orderly. A shock, I know. We sacrifice having basic needs met to hit those higher levels. There are examples everywhere. We lose sleep night after night after night going for a promotion. We eat a plate of fries when the problem is not that we are hungry, but that we are lonely. We let obsessions with mastering a level on a video game run over our loved ones. We skip meals to fit into a gorgeous dress because we want above all else to be beautiful. We often choose to meet needs out of order. And, if under extreme circumstances there is little to no possibility of having our basic needs met, we strive to fulfill any of the needs we have any chance of meeting. Gang members may find their need for belonging is stronger than their need for safety. During unspeakable horrors like the Holocaust, people have turned to learning and appreciation of beauty as the only needs they could fulfill or help others fulfill. Countless people have had to look at transcendence as the only need they could hope to meet in the midst of war or starvation or natural disaster. Our needs are irreducible. I want a visual reminder that every person alive on earth has real needs. A reminder that my needs are real, that the needs of other people are real, that meeting those needs is imperative. I want a reminder that this organization of those needs has often helped me and others, and I feel anchored by it. I want a simple, striped, triangle tattoo. I also would really, really like it if this tattoo didn’t also scream to the world, “I wish I were a twenty-something hipster who loves the clean lines of geometric shapes” when I am really a thirty-something conventional mom and former educator who actually prefers photo-realistic tattoos of things like flowers and insects and birds. That isn’t a real need.